You all know I'm a huge fan of A Song of Ice and Fire. Now, no one in their sane mind would want to go to Westeros, but if I were so unlucky, here are 4 questions to explore and take full advantage of before the ice zombies come! Psst, for non-ASOIAF readers, you're making a mistake. BUT, there will be no spoilers and you can still read all about my cold-heartedness in this crapsack world. 1. Which Westerosi House would you belong to? You could always choose to be a commoner, but why would you do that? Personally, I'd definitely choose House Targaryen. 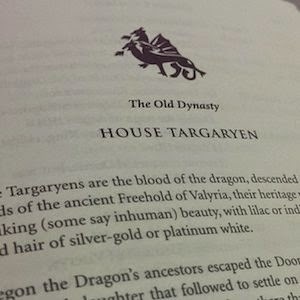 I'd love to be as badass as Dany, of course, but even otherwise, there's something tempting about a royal dynasty, fallen or not. Fire and blood is also a great way to sum up my writing. Although I quite like the Faceless Men and valar morghulis. 2. What are the colours of your dragon and its name? To be honest, my dragon would be in the colours of this blog: crimson and cream, blood and ivory. (Yes, I just said the same thing twice in poetic terms. Go me!) There's something not so devilish there as red-and-black, but still with its own macabre elegance. As for its name, I would either go with damask, which can mean pale red, a type of woven fabric, or a folded steel. (How fitting!) Or, I'd go for magnolia, which is the English name for the flower called Mulan in Chinese. I'm convinced you can guess why. 3. Which Valyrian sword would you own? The art of making Valyrian steel was lost with Valyria, but there are still several Valyrian swords left in Westeros. Ice of House Stark, Longclaw with Jon Snow, Oathkeeper with Brienne, Widow's Wail with Joffrey, Heartsbane of House Tarly, Lady Forlorn with the Corbrays ... there are quite a lot for a supposedly lost art. But I'd go for one not strictly Westerosi: The Dark Sister, first wielded by Visenya Targaryen, one of Aegon I's wives. I'm guessing it'll be at least easier for me to hold than those heavier longswords, and honestly, who needs a better predecessor than a dragon-riding queen? 4. Which Free City would you live in? The hundred isles of Braavos in the sea, with its purple-sailed ships and the Titan's watchful gaze and the freaking House of Black and White. With its history of establishment by runaway slaves and its ports from Westeros and Essos both, I feel some kinship since Hong Kong is a former colony, a coastal city, and a prime example of East meeting West. Although Volantis has its charms, with its political tigers and elephants. It's your turn: answer these questions in the comments! You're also a bookworm? Join the inside circle of literary love for monthly letters from me! I think I'd want to be a Lannister, but I wouldn't want to live at King's Landing. Like, I think the perspective and choices of the Lannisters are so intricate and interesting and I'm like whaaaaaat, but also they like being in charge, so maybe I could be some obscure cousin who has an internship at Winterfell or some other place where I wouldn't be killed in the first book. Lannisters ARE pretty cool. I don't think you have to worry much about the first book, you should probably worry about the last couple books. Maybe you could be the handmaiden who hangs out with Myrcella in Dorne? As we're so often reminded, they don't hurt little girls in Dorne. 1. House Tyrell, purely for aesthetic reasons - I think their sigil (a golden rose on a green field) is so beautiful! 2. Hmm, I’d really love a dragon that’s black and gold (apparently I’m obsessed with gold, so), and the name “Vespertide” would be pretty cool, especially since it’s so hard to find an everyday use for such a wonderful word! 3. Definitely Oathkeeper, mostly because I have ALL THE FEELS for Brienne + Jaime (though I’m not sure GRRM will ever make them canon, sigh). 4. To be honest, all the Free Cities blur in my brain (I have a really bad sense of direction IRL, so that’s probably why, heh), but my favorite would have to be Braavos as well, just because there are so many different religions/customs/people smushed together in one place, and it’s just super awesome worldbuilding, y’know? You're right, the Tyrell rose is rather pretty. But did you see that scene in the TV show when Olenna was mocking how unthreatening it was? I don't necessarily agree, Diana Rigg is the best. Black and gold are the colours of House Greyjoy, so you're not alone in that :D Does quite match with the idea of sunset and evening, considering they're the westernmost place in Westeros. And I think we should be more worried if GRRM makes them canon. They'll probably die horribly. *whispers* I get them mixed up all the time too. Even more so Qarth and Slaver's Bay and the rest. But Braavos definitely beats them all. AGH. These are good question. I don't even know where I'd belong. I'm such a cold frog so I'd probably be okay with the Starks. If the Wall took girls, though? THAT'd BE ME. Living alone and solitary and stabbing icy things. *nods* Plus I have hair similar to Jon Snow's so, that totally qualifies me for the wall. OR I'D BE A TARGARYN TOO BECAUSE DRAGONS. I'm like 98% sure I'm a dragon as is anyway. The mammoth size of ASOS isn't why you should be worrying. It's the ton of tissues you should be preparing. 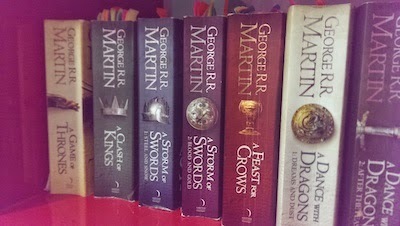 I want to read Game of Thrones so bad (it actually, physically hurts). But I'm reluctant to buy the whole series because I know once I get started I won't be able to stop, from what I've heard of it. Plus, some dude at the local library took the only avaliable copies months ago. >:( Hopefully I can come back here once I've read...the second book, isn't it? Thank you Joy! The TV show is a nice adaptation overall (if we ignore a few horrible changes in Season 5) but some of the best stuff is simplified -- I believe we only see one or two Free Cities. OMG TAKE YOUR BOOK BACK FROM YOUR COUSIN AND START READING. DO THE DO. I stopped (for now) at Book 3 so I will mix in both the books AND TV series. I am House Tyrell all the way! Because Margaery is so cunning but also all the riches and also ALL THE RICHES. But I can see why you'd want to be a Targaryen. And oh. I like the color of your dragon! Mine will prolly have the colors of the Siege and Storm paperback cover (too lazy to name the colors. Lol). I'd call him Pierre. As for the the Valyrian steel, I'd rather have Joff's be reforged to have my own. It'll be as slender as Needle and it'll have an accompanying dagger. 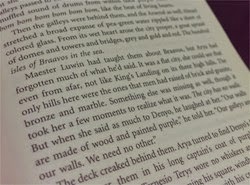 And if I were banished from Westeros, I'd live in Braavos too. Mix it all, we are book- and TV- welcoming! House Tyrell is pretty damn cool, although Olenna is a bit more awesome than Margaery through sheer sassiness. Leigh Bardugo's books do have such wonderful covers! Pierre is ... well, it's not a typical dragon name, but it DEFINITELY suits you. A dagger like the one used on Bran Stark? :P But Needle is a super popular choice, it seems, even if it's not Valyrian steel. Braavos is the best Free City, hands down. 1 - I'd like to by Tyrell because they are really sneaky and classy at the same time! 2 - I work with jewellery and we have a beautiful pearl called Tahiti which is blue but when it hits the light it goes all different colours, my dragons would be like that! 3 - I don't want a big fancy sword, I'll have Arya's needle! 4- I think Braavos would be for me too! You definitely should, Noor! It's a long read but very enjoyable. I haven't read Game of Thrones...but it sounds so cool. It has such a great fandom for it too. I don't know the size kinda intimidated me. I know, I know, I'm a bad fangirl >.< *cringes* ALSO, I'm sliiiiightly afraid of what happens to the characters. From what I've heard of George R.R Martin. And the list of characters that he kills...please tell me that isn't true XD i'm 98% sure that they are. BUT I NEED TO START. Dragons?! YES! Crimson and cream, blood and ivory. 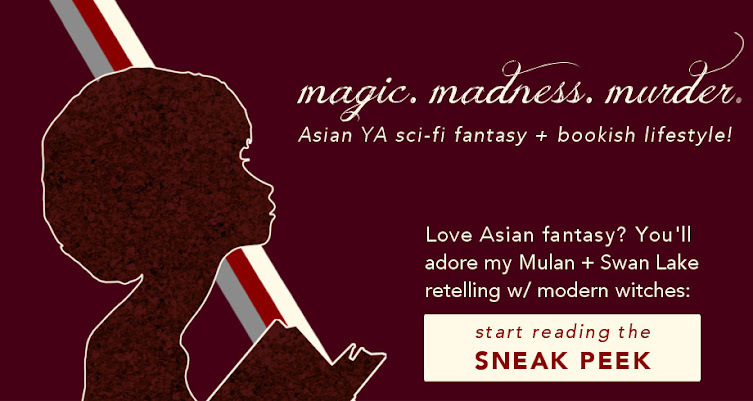 That sounds so cool :P Also Mulan, as in the Disney movie. I really hope you mean the Disney movie now, since I have no life otherwise *cowers* ANYWAY. The fandom is really cool. The art, the headcanons ... although there aren't that many fics out there. Well, you should be scared, but new characters manage to steal your heart again almost right away, so I wouldn't hold back on that. Aww, thank you! Well, I really meant the original folk tale, but sure, why not the Disney. Because I want you to have a life. Whoops, so sorry about that! I'm investigating using Disqus instead, so I hope to see this fixed soon!